This endearing early seventeenth century portrait of four young children and their dog has survived in remarkable condition with much of the original glazes and brushwork intact. They form a compact group, which virtually fills the entire painting, and the composition is not in the least bit stiff, thanks to the children’s tender gestures – the younger boy grasping his elder brother’s arm, and the youngest girl holding on to their pet dog. Private collection, USA until 2016. The Weiss Gallery, A Noble Visage, 2001, no. 18. The symbolism within the portrait provides a pointed and aspirational narrative that would not have been lost on contemporary viewers of the work. For example, the presence of the family dog, apart from being a charming pictorial device, is a clear allusion to fidelity and to breeding and training – how nature can be corrected by means of education and exercise. The book that the young brothers hold together further alludes to their education, while the basket of cherries and apple held by the youngest daughter are references to her innocence and future potential for a fruitful marriage. The inclusion of fruit in child portraiture also signified that children should be cared for and cultivated, in the same way that fruit should be cultivated for a rewarding crop. The eldest daughter holds a small book, most likely of prayers, to project her piety, as well as a richly embroidered silk glove, a costly accessory and reference to her gentility. The portrait clearly represents the difference in maturity between the children: the two boys are represented as scholars, old enough to attend school, their seriousness emphasized by the severity of their costumes and a certain assurance of manner. The eldest sister is presented as a pious and well educated young woman, whilst in contrast her younger sister is more playful and her occupation with their family pet and colourful attire suggest the lively, carefree existence of a child not yet at school. The girls’ costumes are sumptuous and richly embroidered with intricate ruffs and lacework, all of which indicate that they were clearly the children of a wealthy patrician family. In particular, the eldest girl proudly holds her gloves in such a way that the embroidery on the cuffs can be clearly seen. 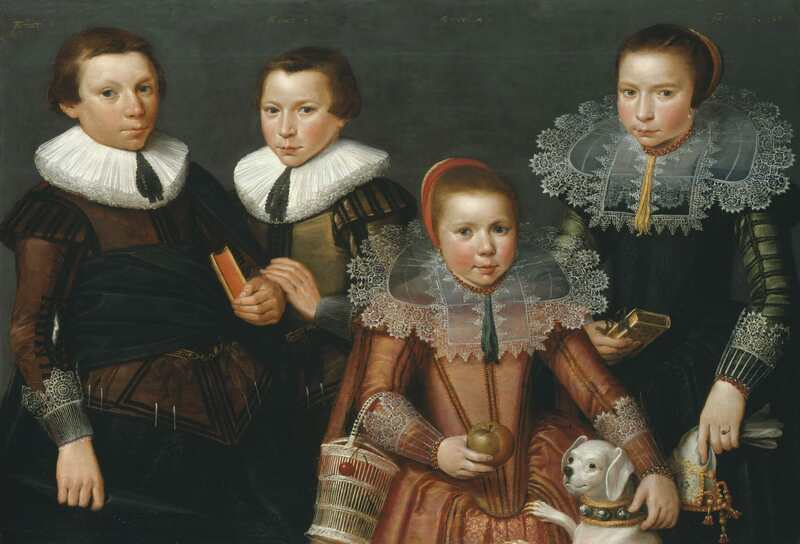 Their highly decorative clothing and distinctive lace collars suggest that the family came from the Dutch province of Zeeland, the westernmost province of the Netherlands. The costumes are so distinctive that the dresses and lace collars are almost replicas of those worn in a portrait of nine-year-old Janneke de Looper from Middelburg, also dated 1627. The painterly style used suggests that the artist is of Flemish origins, a theory that would correlate with the political upheaval experienced by the Southern Netherlands during the late sixteenth century and it appears that our painting is an exciting mixture between North and South Netherlandish elements, typical of attributions to other anonymous Flemish refugee painters working in Zeeland. Following Antwerp’s re-conquest by Spanish forces in 1585 and the subsequent expulsion of all non-Catholics, many Protestant Flemish artists moved to Zeeland and settled in its capital, Middelburg, a prosperous trading centre. Middelburg gained much of its wealth from the influx of these Flemish émigrés, among them artists including Ambrosius Bosschaert (1573 – 1621). It also benefited enormously from the presence of the Dutch East and West India Companies, both of which established important regional offices in this well-situated maritime city. Middelburg’s wealthiest citizens adorned their homes with luxury goods from around the world and their gardens with rare bulbs and plants. It was only natural for these rich merchants to commission portraits of their children as well. With this in mind, and on stylistic comparison, our painting has been recently attributed to an Anonymous Flemish artist working in Zeeland in 1627. J. Bedaux, ‘Discipline for Innocence. Metaphors for Education in Seventeenth-Century Dutch Painting’, The reality of symbols. Studies in the iconology of Netherlandish art, 1400-1800, 1990, p. 127. The province, located in the south-west of the country, consists of a number of islands and peninsulas (hence its name, meaning ‘sea-land’) and a strip bordering Belgium.